Citation tools can go by many names: citation software, citation managers, citation generators, reference management software, bibliographic management tools, etc. While the name may vary, they do have some common elements including the main function of collecting and organizing citations. Most of these software packages also allow for the creation of works cited or references lists in a variety of formats and styles. The ability to integrate with word processing software is a key feature of many of the more popular citation software. Citation generators are tools that automatically create citations for your research materials. 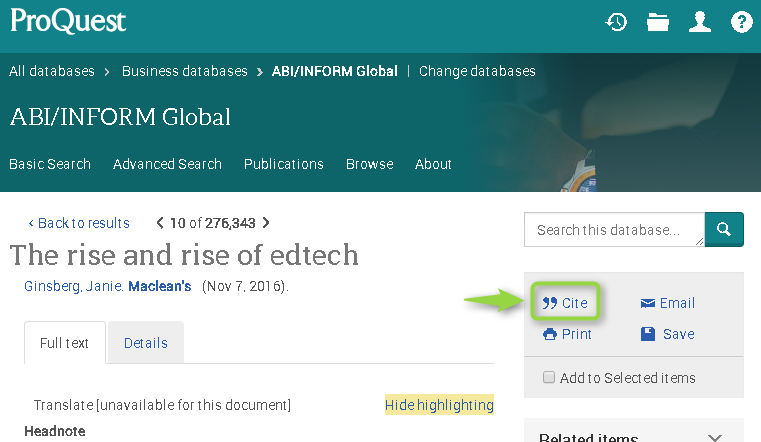 Citation managers not only generate citations automatically, but also helps you collect, organize, store and often share your research materials. Are citation software products free? A multitude of citation software exists including free and paid options. RefWorks and EndNote are popular retail citation software in use at colleges and universities. Some popular free software include Zotero and Mendeley. Note, while these latter are free, they do offer additional features and/or storage for a fee. Visit our online Bibliographic Management Guide for more info about Zotero. Are the citations created by citation software accurate? As these tools are becoming more popular it is important to note that they have limitations and should not be used in isolation. Basler Library strongly recommends that all citations should be checked for accuracy using either the MLA or APA citation format. Please be aware that automatically generated citations may not provide accurate results. If you choose to use a citation software product, take the time to make the necessary corrections using the appropriate citation guides. Remember: It is your responsibility to double-check the results!